The Sony Reader PRS-T1 Wi-Fi is a light and thin ebook reader that doesn't quite measure up to the competition. If the only two specifications you care about are the weight (167 grams) or the thickness (9.5mm) then this might be your best option. However, if you care about an accessible interface, extra features beyond the basic book store, and a reasonable (slightly higher) price, the Kindle 4 is a better bet. Available in red, black, or white, the Reader is a stylish and svelte ebook reader that felt comfortable during several long ebook reading sessions. You can borrow books from your local library, download free Google Books selections (including many Dickens classics), and play music files. The direct competitor is the Amazon Kindle 4, which costs £89. That reader, at 170 grams, weighs about the same. Both devices have a similar 167ppi 16-level greyscale screen. The one slight difference is that the Kindle has about 2GB of space for books; the Reader has only 1.3GB. 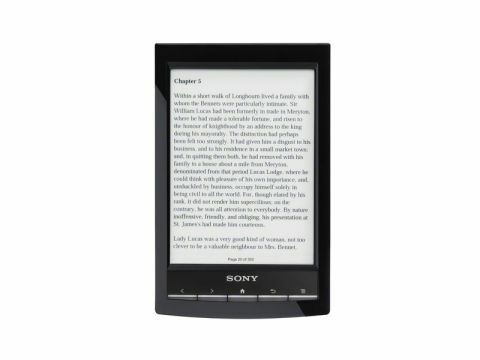 The Sony Reader presents most UI options clearly – there are buttons to find your downloaded books, access the newspaper portal, and browse a Web site. The unfortunate downside to the E-Ink Pearl screen technology is that the Reader tends to flicker too much – about the same as the Kindle 4, but not nearly as much as the upcoming Kindle Touch (which has no UK release date confirmed yet). While Amazon has done an excellent job of linking your book reading to your book buying, there is a similar streamlined approach with the Reader, but it's a bit less useable. You can search for books easily and buy them on the device. There's a logical flow for book ownership. For example, the Sony Reader for PC or Mac software runs as a desktop app where you can also buy and read books. (Sorry, Linux users are out of luck.) There's an Android app, and a reader app for Sony tablets. There's no iPhone or iPad app for Sony books, and for the desktop you have to use the app since there is no Web version. The Reader has a few interesting UI features. One is that you can hold down on any word to see a dictionary look-up, and the device supports 12 languages. As a touch reader, you can also swipe to the left or right to turn pages, and pinch to zoom in on a Web page or newspaper article. Sony offers about 2 million books in their ebook store, and we found most best-sellers. Some titles, like the recent Steve Jobs bio, were the same price in the Sony store as the Kindle store. However, some ebooks, like Inheritance by Christopher Paolini, were conspicuously missing from the Sony store. The Sony Reader is exceptionally light, and the basic book reading options are powerful enough. The extra features were a bit wonky, and the screen flicker became a serious problem during our testing. For £129, the Sony Reader PRS-T1 is a good buy if you prefer a light and thin dedicated ebook reader. That's still £40 more than the Kindle 4, so the Reader has some stiff competition in the ebook market.